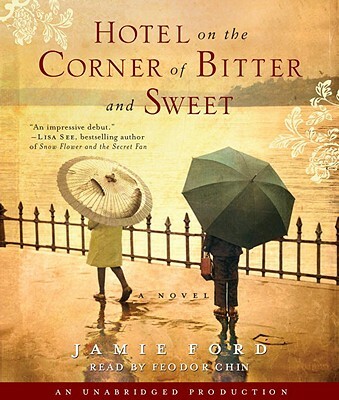 "A tender and satisfying novel set in a time and a place lost forever, Hotel on the Corner of Bitter and Sweet gives us a glimpse of the damage that is caused by war--not the sweeping damage of the battlefield, but the cold, cruel damage to the hearts and humanity of individual people. Especially relevant in today's world, this is a beautifully written book that will make you think. And, more importantly, it will make you feel." "Jamie Ford's first novel explores the age-old conflicts between father and son, the beauty and sadness of what happened to Japanese Americans in the Seattle area during World War II, and the depths and longing of deep-heart love. An impressive, bitter, and sweet debut." Jamie Ford is the great-grandson of Nevada mining pioneer Min Chung, who emigrated from Kaiping, China, to San Francisco in 1865, where he adopted the Western name "Ford," thus confusing countless generations. Ford is an award-winning short-story writer, an alumnus of the Squaw Valley Community of Writers, and a survivor of Orson Scott Card's Literary Boot Camp. Having grown up near Seattle's Chinatown, he now lives in Montana with his wife and children. From the Trade Paperback edition. "Mesmerizing and evocative, Hotel on the Corner of Bitter and Sweet is a tale of conflicted loyalties, devotion, as well as a vibrant portrait of Seattle's Nihonmachi district in its heyday." “A tender and satisfying novel set in a time and a place lost forever, Hotel on the Corner of Bitter and Sweet gives us a glimpse of the damage that is caused by war--not the sweeping damage of the battlefield, but the cold, cruel damage to the hearts and humanity of individual people. Especially relevant in today's world, this is a beautifully written book that will make you think. And, more importantly, it will make you feel."